Boris Johnson has likened the way President Putin is promoting the World Cup in Russia to Hitler’s notorious use of the 1936 Berlin Olympics. The foreign secretary said Labour MP Ian Austin was “completely right” to say Russia’s president wanted to “gloss over [his] brutal corrupt regime”. Mr Johnson said that he would have an “urgent conversation” with Russia about the safety of fans at the tournament. A Russian Foreign Ministry spokeswoman said he was “poisoned with hatred”. A Downing Street spokesman confirmed Mr Johnson was speaking on behalf of the government and that they were working closely with police on plans for the World Cup. The foreign secretary said it was of “crucial importance” in light of 23 British diplomats being expelled from Russia – including the individual responsible for football fans. So far, there have been 24,000 applications from England fans to attend the World Cup this summer, compared with 94,000 at the same stage in the build-up to Rio in 2014. The Foreign Office will produce detailed travel advice closer to the time. The exchange came as the Foreign Affairs Select Committee discussed the Salisbury spy attack. Sergei Skripal and his daughter Yulia remain in a critical condition in hospital after being poisoned with the Russian nerve agent Novichok. The former military intelligence officer and his daughter were found slumped on a bench and unconscious on 4 March. 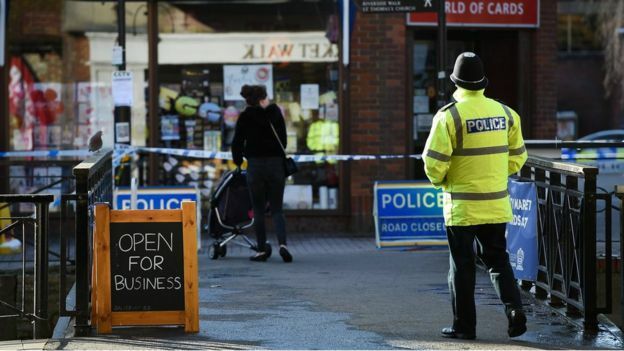 On Thursday, Theresa May will tell EU leaders that although the attempted assassination of the Skripals took place on UK soil, the Russian threat places all European nations at risk. Earlier, Boris Johnson described it as “a sign” from President Putin that “no-one could escape the long arm of Russian revenge”. He also said Russia chose the UK for the attack as it had “called out” Russian abuses “time and again”. Just when you thought relations between Britain and Russia couldn’t get any worse. Drawing any sort of parallel between Vladimir Putin and Adolf Hitler is incendiary. Much of Russia’s self-image is based on accounts of the Soviet Union’s triumph over fascism and Nazism in “The Great Patriotic War”- never mind that there had been a Nazi-Soviet non-aggression pact until Hitler smashed it by attacking Soviet positions in 1941. Boris Johnson has been trying to keep this major row an international one, pitting Britain and her Western allies against the Kremlin. That international support for Britain undoubtedly remains strong, but just now the diplomatic dispute feels a bit more like a bilateral one- between two states – once again. Adolf Hitler became German leader in 1933 and used Berlin’s hosting of the Summer Games of 1936 as part of the propaganda for his Nazi regime. 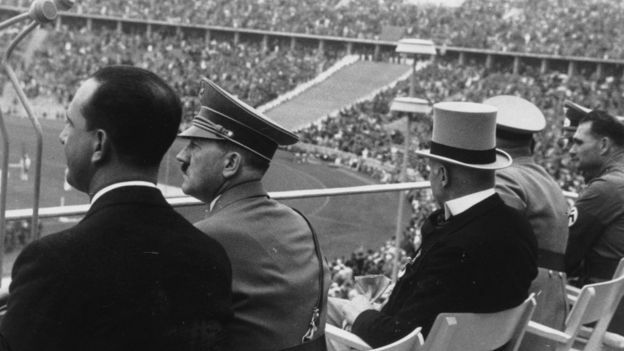 He had already brought in rules in the country to ensure all athletics organisations had an “Aryan-only” policy, which led to international backlash. But despite boycott threats, the games went ahead. Speaking at the Commons committee hearing, Mr Austin said: “The idea of Putin handing over the World Cup to the captain of the winning team; the idea of Putin using this as a PR exercise to gloss over the brutal, corrupt regime for which he is responsible; it fills me with horror,” he said. Mr Johnson could be heard saying, “I’m afraid that’s completely right, completely right”, during Mr Austin’s comments. The foreign secretary then added: “Your characterisation of what is going to happen in Moscow in the World Cup, in all the venues, yes, I think the comparison with 1936 is certainly right. However, when Mr Austin said he believed the football team should pull out of the competition, Mr Johnson disagreed. “On balance it would be wrong to punish them [the fans] or the team who have worked on this for an incredibly long time, given up their lives to it,” he said. On the issue of fan safety, Mr Johnson said he needed to have an “urgent conversation” with the Russians around how they “propose to fulfil their obligations under their FIFA contract to look after all fans”. However, he admitted this conversation had yet to take place. Despite the attack, Mr Johnson said the overall aim of improving relations with Russia – as discussed during his trip to Moscow in December 2017 – remained “effectively unchanged”. He claimed the UK had “many admirers among the Russian people” and the UK wanted to “hold out the hand of friendship” to them, as the quarrel was with the Kremlin, not the citizens. Meanwhile, the British ambassador to Russia, Laurie Bristow, has been accused of snubbing a meeting called by the foreign ministry in Moscow to discuss Skripal case. A tweet from the Foreign Office said a representative did attend, but added: “We received no credible explanation why a nerve agent produced in Russia was used on UK soil. Speaking at the meeting, Russian foreign ministry official Vladimir Yermakov suggested the UK might have been behind the attack. “Either the British authorities are not able to provide protection from such a, let’s say, terrorist attack on their soil, or they, whether directly or indirectly, I am not accusing anyone, have orchestrated an attack on a Russian citizen,” he said. Mr Yermakov also disputed the UK’s finding that Novichok was used in the attack. “Any use of a military-grade poison would inevitably lead to numerous casualties immediately on the site of the poisoning,” he said. 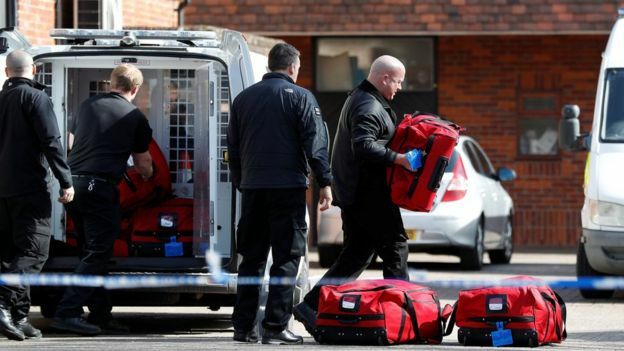 In Salisbury, inspectors from the Organisation for the Prohibition of Chemical Weapons have arrived to begin collecting evidence, including at The Mill pub, where the Skripals drank before falling ill.